The Baby Jogger City Tour Lux is an updated version of the City Tour model which is a lightweight compact travel stroller. The Lux stroller is still lightweight and compact, but has a reversible seat, travel system capability and can be used from birth unlike City Tour that has to be used from 6 months. The reversible seat has a very deep one-hand lever recline (my favorite type of recline) that goes to almost a flat position suitable from 3 months and up to 45 lbs. The adjustable leg rest goes up and down providing more room to stretch. The large canopy features three panels plus a large sunvisor that can be tucked away when not needed. The hand brake is super flip-flop-friendly! LOL. The large and easy-to-access basket can fit your large diaper bag. But the main and the most impressive feature of Lux is its compact one-hand fold. You can hold a child in one hand and fold it with the other. The auto lock activates by itself without the need of pressing the stroller together (like on many other models). There is also a standing fold and a carry handle for easy transporting. I would say this is as compact as reversible-seat strollers get. It might even fit in an overhead storage compartment on the plane, of course depending on the air line. Perfect for traveling parents! The Lux is 19 lbs which is about average weight for a reversible seat model. Another thing that I like is the ability to transform into a travel system with the addition of a car seat or a pram with a bassinet (sold separately). It works with most popular car seat brands. There is also a stroller board option for an older child. So, far I’ve seen great reviews from parents who absolutely love this new model. The only complains I’ve seen is the lack of included accessories. Not a big deal in my opinion. So far I’ve been impressed with all the features. I think it will be very popular model this year. The City Tour Lux retails for around $299 and comes in four colors. The only included accessory is a travel bag. I heard some parents complaining about high price, but I feel like it’s fair price for a stroller that will last your for years. -Large canopy. It has a large UPF 50+ thee-panel canopy plus a two-panel pop-out sunvisor that provides plenty of shade. This is a great canopy size for a lightweight model. There is also a large mesh viewing window with a magnetic closure. The cool thing about the closure is that it uses magnets to stay open so you don’t need to roll it anywhere. Just open it and it will stick to the canopy. -Non-adjustable handle bar. The rubber handle bar is not adjustable and is located 38″ from the ground. I think it’s a good height for shorter parents, but might be too low if you are much taller. BTW, the average handle bar height is about 40″. I have mixed feelings about rubber cover. On one hand it’s easy to clean and is very durable, but on the other hand it’s not that soft when used for long periods of time. -Reversible seat. The seat is 10″ wide with 19″ seat back and a measurement of 22″ from the bottom of the seat to the top of the canopy. The seat is a little narrow comparing to the average of 13″. Could be a problem for larger child. The canopy height also could’ve been a little taller. For comparison Yoyo+ Plus model (the most popular travel stroller) has it at 26″. The seat is very well padded and is reversible so your child can face you or the world. -Deep recline. It has one-hand lever recline that reclines only the back of the seat providing your child with plenty of room to stretch. This recline goes to almost a flat position and is suitable from 3 months and up to 45 lbs. Great space for naps and quickly diaper changes. If you want to use it from birth, you can replace the seat with a bassinet or a infant car seat (sold separately). -Adjustable leg rest. It’s always nice to see an adjustable leg rest on lightweight strollers. Definitely a big plus. -Adjustable 5-point harness. It has an adjustable padded 5-point harness with a center release button. -Nice basket. It doesn’t have the largest basket, but it’s pretty decent. Should fit your large diaper bag. You can access it from the back or the front if the seat is reversed. Again, for the lightweight model it’s not bad. There is also a small zipper pocket in the back for small essentials. For even more storage, I recommend getting an universal stroller organizer instead. That way you can take not only your coffee cup, but also a LOT of stuff including keys, phone, water, wallet, snacks, diapers, toys, and more. The amount of stuff I can fit into this organizer is unbelievable. And, the best part is that I can use it on ANY of my strollers. -Hand brake. The hand brake on the side of the frame is super easy to engage and is super flip-flop-friendly! LOL. No more shoe scratches. -Never-flat wheels. It rolls on four small 5″ wheels. The front wheels are swivel, but can be locked straight. This buggy is designed for flat surfaces, but could tackle some terrain. -All-wheel suspension. It helps to absorb some of the bumps making the ride smoother. Keep in mind, this is NOT a jogging stroller despite having “Baby Jogger” as part of its name. “Baby Jogger” is just the name of the company. You can NOT jog with this stroller. -One-hand fold. Love the fold! You can fold this stroller with just one hand, but it requires multiple steps. I like that this is a TRUE one hand fold, meaning you can actually hold a child in one hand and fold it with the other. No need to press the stroller together to activate the auto lock. It activates by itself once you lift up the folded stroller. I found the fold to be intuitive and parent friendly, meaning it’s not going to be a fight to fold and unfold the stroller. LOL. The seat can be facing in either directions. There is also a standing fold that gets very handy when traveling. The folded dimension are 24″L x 21″W x 11″H which is very compact for a reversible seat stroller. For comparison, YoYo+ Plus is 7″L x 17″W x 20″H. -Carry strap and shoulder strap. You can carry it by the hand strap or by using an attached shoulder strap. Since it weighs almost 20 lbs, I would probably use my hand because it’s a little heavy for my shoulder. -Bassinet option. You can replace the seat with the bassinet to convert it into a pram. The bassinet folds in half and can be folded with the stroller. -Glider board option. Great for an older child. -Travel system option. You can turn it into a travel system by getting adapters. Works with most popular brands. 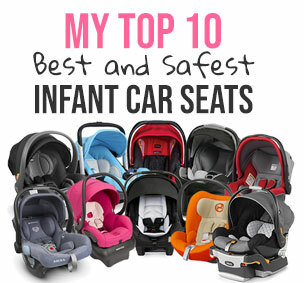 Here is my list of top safest car seats. -Travel bag. INCLUDED! The bag comes quite handy when traveling. It has a carry handle and shoulder straps so you can wear it like a backpack. It’s not very well made but it’s free. LOL. This is the only accessory included. -Small wheels. As with most lightweight models the wheels are small and can’t really handle much of the terrain. -Lack of included accessories. I would like to see a cup holder and a bumper bar included but those could be purchased separately. -Narrow seat. The seat is only 10″ wide which is a little narrow comparing to the average of 13″. There are a lot of different accessories available for purchase. Baby Jogger City Tour LUX Foldable Carrycot – Thanks to this accessory you can use City Tour LUX from birth, it’s perfect for long-distance strolls with newborn. It has big advantage: you can fold it in half (separately, or when it’s attached to the frame). It comes in the same colors as the whole stroller. Cup Holder & Bumper Bar Set – You can add to your City Tour LUX a belly bar for your child and a beverage holder that doubles as a storage for snacks or small toy. Glider Board – This stroller gives parents option of attaching a Glider Board – to make a room for the older sibling. Awesome solution if you have a newborn and older toddler or toddler and preschooler. The Baby Jogger Maxi Cosi/Cybex CSA Click Connect Car Seat Adapter is the easiest way to turn your stroller into a customized travel system. You can even fold the stroller with the brackets attached, giving you the most versatile travel system available. Here is a detailed video overview. Baby Jogger gives a lifetime warranty on the frame of the stroller and 1 year on small parts and fabric. Here is more information on the warranty. The Baby Jogger City Tour Lux is available in four colors: granite, slate, iris and rosewood. All colors come with a black frame. My favorite place to buy strollers and a lot of other baby items is Amazon. It usually has the lowest prices, free shipping, and free returns. How great is that? You can get Baby Jogger City Tour Lux in one of the four beautiful colors for around $299 on Amazon (free shipping/free returns). The only accessory it comes with is a travel bag. Which is better? City Tour Lux or City Mini GT ? I was going to get City Mini GT but this Jogger City Tour Lux looks good , too. Does the stroller fold with the infant car seat adapters attached? How do you attach the glider board? It’s not listed as compatible on the Baby Jogger website and I’ve had trouble trying to attach mine. Any tips? Thanks! Is the the tour lux in ash color rain proof?